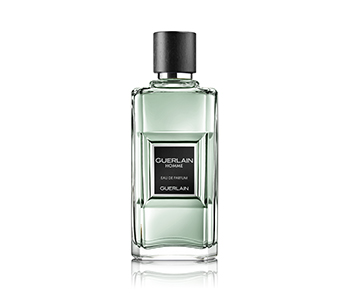 GUERLAIN Homme is a scent suffused with instinct and freedom; its masculinity fits like a second skin. It is supple enough to be worn as comfortably in a tuxedo as tennis shoes. Distinguishable for the agility of his reflexes and the fluidity of his movements, the GUERLAIN Homme man trusts his innate intuition. An incontestably refined animal, he follows an initiatory olfactory path in search of an inimitable and enduring new, wild freshness that suits him perfectly. Vibrant freshness inspired by the Mojito, with a squeeze of lime, a few crushed leaves of peppery mint and a generous shot of real Jamaican rum. A green woody facet combines the firmness of cedar with the wild vibration of vetiver. One can also discern Jean-Paul Guerlain's personal stamp: By adding a rhubarb note, he confers on the fragrance bitterness and bite that echo the freshness of its top notes.